The death of cuisine in France has been greatly exaggerated. Perhaps nowhere but France could there be a tiny village with two restaurants as innovative as those in Saint Amour Bellevue, in deepest Beaujolais. Established by chef Cyril Laugier and his wife Valérie in 1996, Auberge du Paradis in Saint Amour has been my watering hole in the Beaujolais for several years. The hotel has a great atmosphere; Cyril and Valérie are what the French would call très sympa. A boutique hotel, the building gives the impression of having been constructed over time from several different buildings, so there all sorts of unexpected turns as you find your way to your room. Decoration is very stylish, if somewhat idiosyncratic; I suppose I would describe it as French/Italian modern. Breakfasts give the most fantastic send-off before spending a day tasting: I use the plural because they are different every day—even the jams, uniquely spiced, are different every morning. Cyril serves the breakfast himself. The restaurant obtained a much deserved Michelin star in 2014. The current menu starts with a sorbet of aubergine, with a curry vinegar, and basil herbs. The subtle Asiatic influences made this the killer dish for me. It was followed by tuna, marinated with herbs, confit peppers, and Kashmiri influences. Then there was pork that had been marinated in soy, before being cooked in the oven, together with a spaghetti of cucumber. The desert was equally innovative, raspberries with cream of roses. Overall, the style of cuisine seems to have become more forceful over the years I have been coming here. 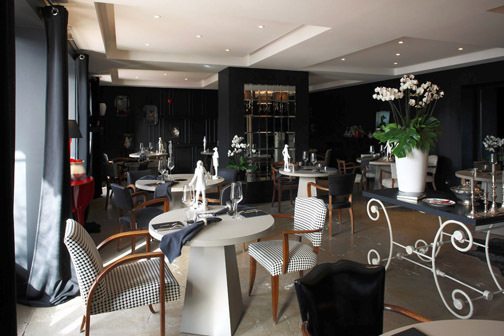 The restaurant at Auberge du Paradis was redecorated in 2014 and is elegant and spacious. Within a hundred yards across the street is a more recent arrival, 14 Fevrier (named for Valentine’s day) by Japanese chef Masafumi Hamano, who came to France in 2004 after working at a French restaurant in Tokyo. He started the restaurant in 2013 and obtained a star from Michelin immediately. 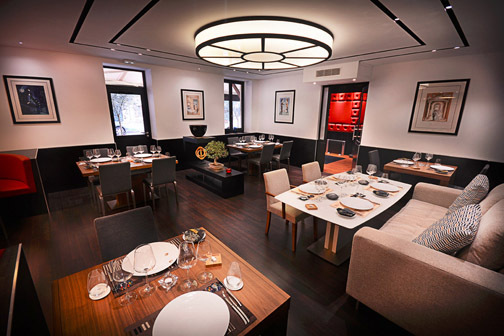 The elegant restaurant shows a Japanese aesthetic and the cuisine is modern French with a Japanese twist. Amuse bouches included a hibiscus macaroon, a verbena macaroon, and vichyssoise with a watermelon sorbet. The first course was described as a pana cotta, but at first sight had nothing to do with it. It turned out the pana cotta was underneath a gelée of turnips. The surprise combination of flavors made this the killer dish for me. The next course was cobia (a meaty white fish) in a lobster sauce. The combinations of unexpected flavors can be a bit tricky to match with wine, but all worked brilliantly. 14 Fevrier is stylish and spacious with a Japanese aesthetic. A feature of these restaurants, as well as many others visited on this trip, has been the treatment of vegetables. I remember that when l’Arpège, the three star in Paris, changed to a vegetarian menu some years ago, it was regarded with a certain degree of suspicion. But now treating vegetables as an important component in their own right, not merely an accompaniment, has become common. I might go so far as to say that this month in France has been an education in vegetables, coming both from the exceptional quality of the produce to innovative treatments. Being in Beaujolais, both restaurants have excellent wine lists with many reasonable choices. At Auberge du Paradis, we had a top Pouilly Fuissé, the 2009 Instarts from Château Beauregard. The richness of the year is beginning to overtake Beauregard’s classic style, but the wine is at its peak now. At 14 Fevrier, we tried a white Nuits St. Georges, les Terres Blanches from Daniel Rion, also 2009, which was interesting as we had tasted the range of reds at the domain a couple of days earlier; it showed the same sense of textured power. Both restaurants essentially have a single menu, which changes periodically. (At 14 Fevrier there is an alternative choice for the fish course.) I do not know what criteria Michelin has for awarding stars—I am not sure that anyone knows, including the Michelin inspectors—but both restaurants have one star. The food at both shows a level of innovation and complexity that would suggests two star, so I suspect the holdback is the fact that each presents only a single menu, with little or no choice. But Saint Amour is the place to go in the Beaujolais. I wish restaurants would adopt rational policies on corkage (as I argued in my previous blog). Alas, rationality in wine policy has not reached France, where I am spending July. 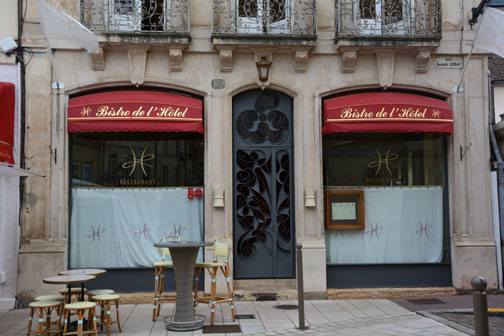 I had a particularly bad experience at the Bistro of the Hotel de Beaune. Since Beaune is the center of the wine trade in Burgundy, you might expect some sympathy towards people who want to drink special bottles of wine for one reason or another. While there are some restaurants with a good attitude, the Hotel de Beaune is particularly hostile. One of my visits on the Côte de Beaune was to Albert Grivault, where after a tasting of Meursault and its premier crus, M. Bardet opened an old bottle to illustrate its aging potential. “If Meursault had a Grand Cru, it would be the Clos des Perrières,” he said, as he opened a bottle of the 1985 from his monopole. It was splendid: mature but not too tertiary, with a faint trace of minerality. (What a counterpoise to the problems of aging whites in the Age of Premox!) After the tasting, he very kindly gave us the bottle to finish off with dinner. The bistro at the Hotel de Beaune where the attitude has become “pas possible”. So we took our bottle and went round the corner to L’Ecrit Vin, where the reception could not have been more different. “You have a special bottle, we have special glasses,” said the owner cheerfully, producing some Riedel Burgundy glasses. The staff all showed interest in the wine, which was magnificent: I had been concerned that over some hours since opening it might have become too tertiary, but it went the other way, with its innate minerality really coming to the fore. It seemed younger six hours after opening than in the initial tasting. I recognize that restaurants can establish whatever policy they like with regards to corkage (and obviously they don’t want people to bring cheap bottles they bought in the town), but as I pointed out in my previous blog, an inflexible policy seems economically against their own interests. The Bistro of the Hotel de Beaune was not full that evening, so all their policy accomplished was the loss of two covers. In case it seems that my description of the Hotel as hostile seems exaggerated, I can only describe our departure. I had not met the owner of the Hotel de Beaune, Johan Björklund, on our previous visits, but he made a point of coming to speak to us when we checked out of the hotel: “I hope you never come back,” he said. Indeed we will not. For people who believe that enjoying a meal requires a fine bottle of wine to match the food, dining out is becoming problematic. When I started eating out, markups on wines in restaurants usually brought the wine to about double the retail price. (Yes, I realize that makes me sound like Methuselah.) At that level, I certainly felt free to experiment and to try new wines that might interest me. In fact, I often made discoveries from restaurant lists. With markups now usually bringing wine to three or even four times retail, this is a completely different game. 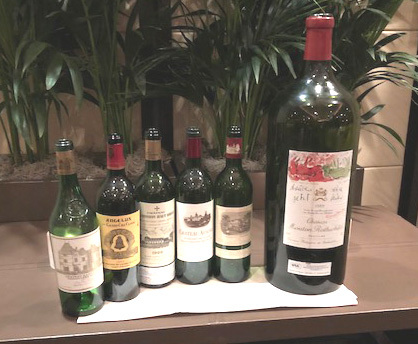 Couple this with sharp increases in retail prices from classic wine regions, and this means that it becomes more or less prohibitive to order Bordeaux or Burgundy from a restaurant list. Enter corkage. While once it was all but impossible to find restaurants that would let you bring your own wine, this has now become much easier in London and New York, to the point at which there are enough choices that I feel able simply to avoid restaurants that do not have a corkage policy. It’s especially noticeable that new restaurants, for whom the cost of establishing a good wine list is significant, seem more reasonable about corkage than longer established restaurants. It is noticeable (perhaps counter intuitively) that it’s the restaurants that have an interest in wine, and which really try to have interesting wine lists, that are more receptive to corkage than those who simply buy their list from a distributor and regard it as no more than a profit center. Whatever the quality of the list, I think the restaurant is acting against its own economic interests by refusing to allow corkage. Unless the food is basically sold at break-even, and all the profits come from selling wine, what purpose does it serve in effect to tell winelovers to go somewhere else. Unless the restaurant is always full, all that has been accomplished is to keep a table empty. A rationale way to handle corkage would be to charge the average profit on a bottle of wine. That way it would make no difference to the restaurant whether you brought a bottle and paid corkage or bought from the list. Another would be simply to charge the cost of the cheapest wine on the list (and the restaurant comes out ahead because they get to keep the bottle). Is it too much to ask that restaurateurs should realize it’s a win-win situation to have a corkage policy that is financially neutral for their bottom line? I have a test for attentive wine service in a restaurant. I stretch out my hand to pick up the bottle from the table or from an ice bucket close by, but before I can grasp it, the sommelier is there. (You might argue that we should never get to the stage at which I feel the need to refill the glass, of course, but sometimes it might not be immediately obvious.) If the sommelier arrives after I have poured the wine and says reproachfully, allow me, as he puts the bottle back, he has failed the test. The situation is usually more easily controlled with red wine, which is most often left on the table, than with white, when the ice bucket is not necessarily within reach. But whether the wine is red or white, I believe that if a sommelier is going to put the bottle somewhere out of my reach, he has created an obligation absolutely to be there the moment my glass is empty. Alas this does not always happen. At one famous restaurant not a million miles from Mâcon, I had two contradictory experiences of brilliant wine service and falling down on the job. I ordered a bottle of Leflaive’s Puligny Montrachet, Clavoillons premier cru. The sommelier came back to say they had run out—but offered the Les Pucelles premier cru from the same vintage at the same price. This was an extremely handsome offer as the price of Pucelles on the list was double that of Clavoillons. This is really harking back to old values, I thought, these days they would more often come back and say, sorry, you’ll have to choose something else. But then during the dinner, my glass ran out, without a sommelier in sight. Against the protestations of my companion, I walked over to the ice bucket a few feet away, collected the bottle and poured us both wine, and then returned the bottle. No one noticed, even when I repeated the performance a little while later. So make up your minds, restaurateurs. Either make sure the wine is always in reach and put salt on the table, or train your staff to be absolutely sure that someone is watching every table every single second. The declaration that restaurant workers must have time off in the middle of the day and cannot be required to work in the evenings came as a joint announcement from the Commissioner for Health & Food Safety and the Commissioner for Employment, Social Affairs, Skills and Labor Mobility. While this was unexpected, it was presented as following directly in the line of previous regulations intended to protect workers from unsocial conditions. The new regulations come into immediate effect, but with a transitional period during which workers may work either at lunch or at dinner but not both. When they take full effect, however, restaurants will have to find other means to prepare and serve food at unsocial times (defined as between noon and 2 p.m. and between 7 p.m. and 10 p.m.). Restauranteurs have reserved comment so far, but there is concern in the drinks industry about collateral damage. European Commission DG for Employment, Social Affairs and Equal Opportunities, Annex 1 – Study on health and safety aspects of working time, 21 December 2010. Ever since Michael Steinberger wrote Au Revoir to All That: Food, Wine, and the End of France, I’ve been on the qui vive for signs of moribundness (is that a word? if not maybe it should be) or liveliness in restaurants in France. In four days in Paris last month, I had a series of innovative meals; Michael’s argument stands insofar as none of them were really classic; a common feature was an emphasis on Asiatic spicing (see New Paris Cuisine is a Challenge for Wine). (In fact, I had some difficulty in finding restaurants that I thought would give an impression of the present state of classic cuisine, as many seemed to have gone overboard for foreign influences.) Those I went to had a subtle interplay of classicism and new influences that I would regard more as reinvigorating their style than abandoning tradition, so in that respect I would take issue with Michael’s conclusions. In the south of France this month, near Nice, experiences have been mixed, but two restaurants in Nice stand out for modern, innovative style, although the influences are entirely different from those I saw in Paris. They share the feature that a key factor in quality is that there’s only a single tasting menu, with no separate à la carte. Both have styles that are crisp and modern with a wonderful lightness of being. In both, you can watch the chef assembling every dish through a window into the kitchen. L’Aromate is an amazing jewel of a restaurant, occupying a tiny space in a shop front in the center of Nice. It has a staff of only two: Mickaël Gracieux is the chef; his wife is the front of house. (There’ve been some complaints about slow service on the web, but don’t worry about it: this is not at all a problem). Crab with ginger influences was a terrific starter. The main course of sea bass with a sauce based on basil and truffles was as good as it comes. A tube of chocolate with caramelized hazelnuts was a brilliant finish. Every dish is presented with a challenge to the imagination. The menu changes every quarter. Restaurant Jan is a little larger, as South African chef Jan Hendrik has an assistant or two in the kitchen, and maintains a style of coruscating brilliance. Salmon marinated with beets was a brilliant starter. Angus beef with beetroot combined a new set of flavors for me. Finally fruits with a sauce of red fruits and roses gave a brilliant combination between influences of fruits and perfume. Two courses on the menu change every fortnight. Wine is a bit of a challenge at both restaurants, as lists are fairly short (but reasonably priced) and courses are so varied, but at both we settled on a red Sancerre, light enough to go with the starters, but enough weight to match the main courses. If you haven’t had a red Sancerre in the era of global warming, you should try one, as they are light years away from the old image of the near-rosé. Outside of Nice, my best experience by far was at the Table of Patrick Raingeard at Éze-Bord-de-Mer (a few miles to the East), where one evening à la carte (which is quite extensive), and another with a tasting menu (which changes each week), both showed wonderful precision of cuisine. Cucumber and half-smoked salmon returned to the theme of Asian spices I found in Paris, and a cassoulet of lobster with spices was the most acclaimed main course. Perched in a garden a few yards from the beach, the restaurant has a positively romantic setting. Classic cuisine, if by that we mean overt use of butter and cream, may have largely died, but new cuisine is alive and well in France. Of course, you can now eat equally well in other countries, and the level of innovation is just as great in, say, London or New York, so France no longer has a monopoly on innovation..